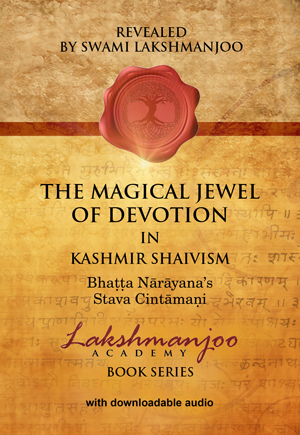 Kashmir Shaivism is known as the Pure Trika System. The word trika means “the threefold science of man and his world.” In the idea of trika, there are three energies: para (supreme), apara (lowest), and parapara (combination of the lowest and the highest). These three primary energies represent the threefold activities of the world. In the thought of the Trika, therefore, it is admitted that this whole universe and every action in it, whether spiritual, physical, or worldly, is existing in these three energies. of four sub-systems; the Pratyabhijna system, the Kula system, the Krama system, and the Spanda system. These four systems, which form the one thought of the Trika system, all accept and are based on the same scriptures (agamas). 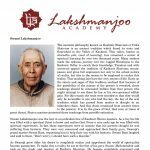 These scriptures form the ninety-two agamas of Shaivism. The monistic Bhairava Shastras are supreme (para) and are sixty-four in number; the mono-dualistic Rudra Shastras are medium (parapara) and are eighteen in number; and the dualistic Shiva Shastras are inferior (apara) and are ten in number. Nature then and there without moving anywhere or doing anything. him. Suppose this girl and her future husband happen by chance to go separately on the same pilgrimage. When they arrive at the place of pilgrimage, they meet. The girl, however, does not feel any importance in this man because she does not know him to be her future husband. Yet her future husband and this man are the same person. Later, when a friend introduces her to him, telling her that this is the man who is to be her husband, then she is filled with happiness, pleasure, and ecstasy. She realizes that this is the same man she had seen before. In the same way, reality dawns in the Pratyabhijna system. In whichever level you are situated, do not mind. At that moment, you realize that you were already the Lord but did not know it because you had misunderstood yourself. In the Pratyabhijna philosophy it is your master who tells you, that ‘you are the same person for whom you are longing’, and he teaches you to reach the goal there and then without adopting any means. This teaching, therefore, is situated chiefly in anupaya, which is that means where there are no means at all. It is the recognition that there was nothing to be done and nowhere to go. Here, there is no practice, no concentration and no meditation. By the grace of your master you realize it and you are there. 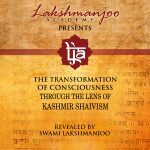 great master Somananda reintroduced the Pratyabhijna system in Kashmir. Somananda’s disciple was Utpaladeva, and his disciple was Lakshmanagupta, and his disciple was the very great Abhinavagupta. realize your nature, and while you descend from the highest to the lowest you also realize your nature. In the practice of the Kula system, you have to realize the totality of the universe in one particle. Take one particle of anything that exists in this world; in that one particle is to be realized the totality of the whole universe. The totality of energy is found in one particle. Everything is full of one thing and one thing is full of all things. The difference between the Pratyabhijna system and the Kula system is, that the Pratyabhijna system teaches you how to realize your own nature in one place and exist there, reside there. While the Kula system teaches you how you can rise from the lowest degree to the highest degree, and all the while, experience the nature of your Self on the same level and state. Shiva, which is realized in prithvi tattva (earth element), is the same level, the same reality of Shiva which is realized in Shiva tattva. Here, there is complete realization in every act of the world. The Kula system was introduced in Kashmir in the beginning of the 5th century A.D. by Shri Macchandanatha. Later, in the 9th century, because its teachings had become distorted, it was reintroduced by Sumatinatha. In the line of masters that followed from Sumatinatha, Somanatha was his disciple. Shambhunatha was the disciple of Somanatha, and the great Abhinavagupta was the disciple of Shambhunatha. The Krama system does not recognize the ways of either the Pratyabhijna or the Kula system. In the Krama system, you must rise in succession, step by step. This system teaches that step-by-step realization makes your realization firm. As the Krama system is concerned with successive realization, it is primarily concerned with space and time, because where there is succession there you find the existence of space and time. In both the Pratyabhijna and Kula systems you are beyond space and time. In the Krama system, it is in the end, not in its process, that you are beyond time and space because it also carries you to that timeless and space-less state. The twelve Kalis are said to be the twelve movements of any one cognition. For example, if you look at any object such as a pot, the sensation travels from your thought to the place of the pot, and then returns again from the place of the pot to your thought, giving you the sensation whereby you realize this pot. You do not realize this pot at the place of the pot, you realize this pot in your mind. Your perception has moved from inside to the pot, and then returned again from the pot to your thought. And these movements are distributed in twelve ways as the twelve Kalis in the Krama system. The rise of prana kundalini is also described in the Krama system, because in prana kundalini you rise from one cakra to another, from one state to another state. As this is a successive process it is found in the Krama system. who was also known as Shivanandanatha. Shivanandanatha had only three chief disciples which he initiated into the Krama system. Because in this system predominance is given only to shakti, all three were females. Their names were Keyuravati, Madanika, and Kalyanika. They were quite prominent and were completely informed in the Krama system. Afterwards, these ladies also initiated disciples, which were both male and female. They realize that there is movement in wakefulness, dreaming, deep sleep, and turya [void]. Though some thinkers argue that there is no movement in deep sleep the philosophers of the Spanda system realize that nothing can exist without movement. The Spanda System was introduced in Kashmir by the great sage Vasuguptanatha in the beginning of the 8th century A.D. Vasuguptanatha is the author of both the “Shiva Sutras” and the “Spanda Karikas.” The disciple of Vasuguptanatha was Kallata. Some teachers think that the “Spanda Karikas” were not composed by Vasaguptanatha but rather by his disciple Kallata. This theory however, is ablolutely incorrect.